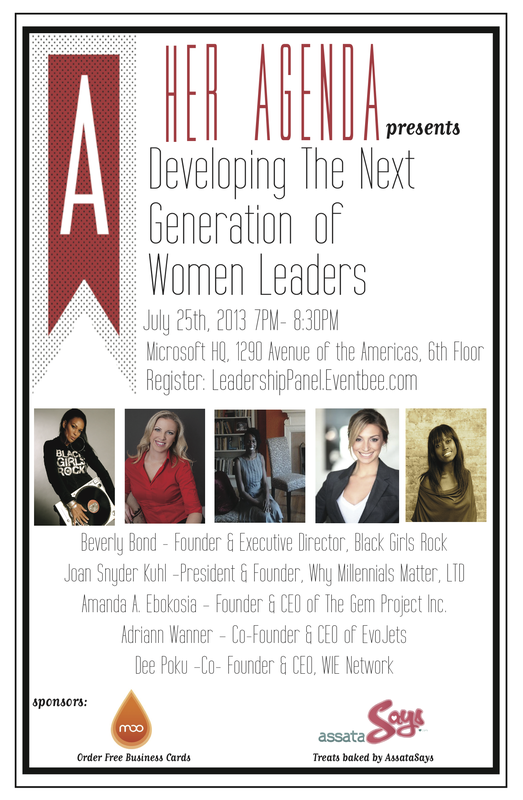 Rhonesha of HerAgenda.com is moderating her third panel discussion this year on Thursday, July 25, 2013. The topic for the evening is “Developing The Next Generation of Women Leaders.” Aside from the great discussion that’s bound to take place, I’ll be baking for the event, Moo.com is providing free business cards to attendees, and guests will have a chance to win “First Globals Understanding, Managing, & Unleashing the Potential of Our Millennial Generation” and a 30 minute coaching session with author/millennial expert Joan Snyder Kuhl. To purchase your $10 ticket ($5 if you’re a student), click here. For more info on the panel click here or visit HerAgenda.com. This entry was posted on Friday, July 12th, 2013 at 5:38 pm	and is filed under BAKED, EVENTS. You can follow any responses to this entry through the RSS 2.0 feed. Both comments and pings are currently closed.